Home/On which products and consumer-targets growth of the organic market could be based-on? To recognize that, we should start withe strong points of the market we already saw in 2017: The organic growth in the individual distribution channels is becoming increasingly divergent: in the volume market of dairy products, the full-range producers are now gaining in points. Only with organic cheese can the discount play to its strengths. Only a small part of the growth is probably at the expense of the specialized trade. 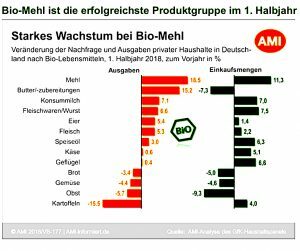 Somewhat more in the growth market of organic meat and sausage, here the specialist trade loses significantly and both full-line producers, but above all the discounters are growing strongly. While meat and sausage are still around 2% organic, the proportion of dairy products already accounts for 6 – 8% – the latter for fresh milk – and is thus a real factor. Interesting that the specialized trade in a core area of ​​the bio oils gives its advantage of competence as full assortment and discount. This market in particular has been a strong growth driver for organic products in recent years. And so it happens that Biomehl is experiencing very strong growth – on closer inspection, but above all outside the specialist trade. As far as buyers of organic products are concerned, Silver Agers aged 55 or over remain a key target group because they generally make up a large section of the population and also have a lot to offer in terms of purchasing power. But thanks to new motivations, we now also see in the analysis that young singles and young families with children significantly increase the proportion of organic among those aged up to 44 in relation. This means that biobuilding is driven by two relatively differentiated buyer groups: the older ones, who are taste and health-oriented in their own way, and the younger ones, who, with their completely new biomotivations, also stimulate growth and develop their family biology. To accept children’s products. It also becomes clear that organic growth currently refers to selective product areas, and that a mere expansion of the organic range from a broader number of articles will only be rewarded where such articles demonstrably correspond to current consumer demand.